Editor's Note: The multiyear centenary of World War I has generated a huge and still growing number of books, looking at the subject from a dizzying variety of perspectives. 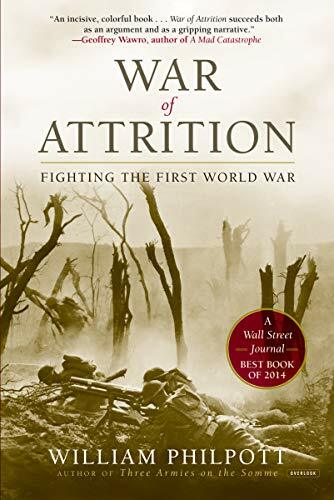 Don Yerxa's piece on "the war of attrition" is the first in a series of four essay-reviews in which (over the next couple of years) he will examine some of the salient themes in this scholarship. For most readers of Books & Culture, I dare say that mention of World War I conjures up images of horrific trench warfare presided over by generals on both sides in the most unimaginative fashion. Wave after wave of soldiers going "over the top" were sacrificed in futile attempts to break the stalemate. The view that the war was a prolonged and senseless bloodbath grew in the interwar years, especially in literary circles. Winston Churchill's wildly popular "memoir-history" The World Crisis (1927) helped to fuel the narrative of a war conducted by incompetent generals who unashamedly accepted shocking casualties as they repeatedly failed to appreciate the nature of modern warfare. This understanding of the war was consolidated in the public mind in the 1960s. More recently, Paul Fussell's extremely influential The Great War and Modern Memory (1975); popular films like Gallipoli (1981), starring a young Mel Gibson; and Sebastian Faulks' novel Birdsong (1993) have reinforced the perception of a futile, unnecessary war. But is this an accurate portrayal of the so-called Great War?